This entry was posted on Wednesday, May 11th, 2016 at 4:48 pm. 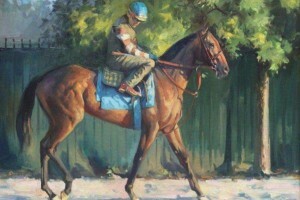 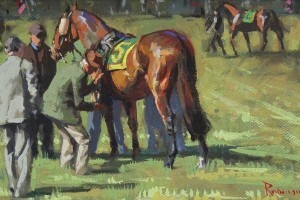 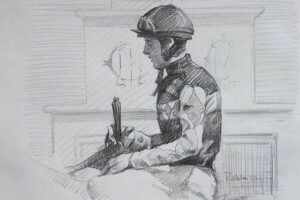 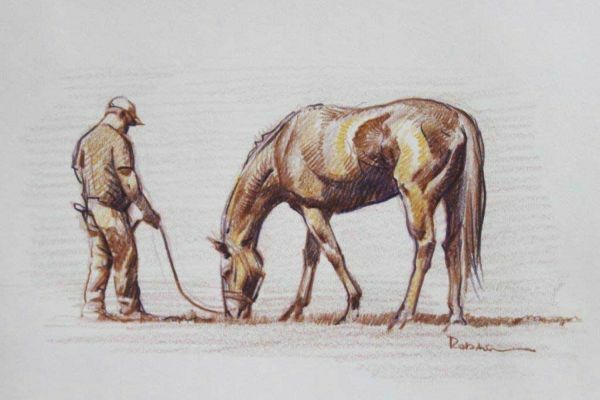 An Art Show, “The Maryland Horse: An Artist’s View,” will feature the original work by equestrian artist, Sam Robinson. 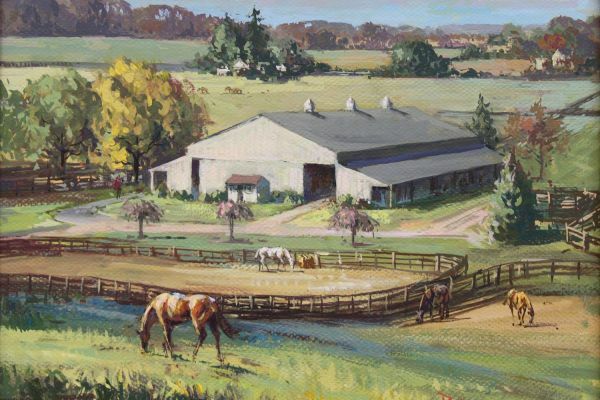 Sam is a Maryland native and currently lives in the Greenspring Valley of Baltimore County where he has a home and studio on a small part of Burnside Farm. “I am near some of Maryland’s great Hunt Country, and the site of several of our Point-to-Point and Timber races. A short drive away are Pimlico Racecourse, home of the Preakness, and the legendary Sagamore Farms, so I am well-situated for a Sporting Artist. The surrounding landscape is rolling hills and valleys with great hardwood trees, populated with horse farms and estates. The subjects found in my work are all a regular part of the life around me. 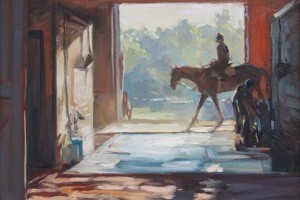 Join Sam on May 16that the show’s opening for a cocktail reception at Halcyon House Antiques! 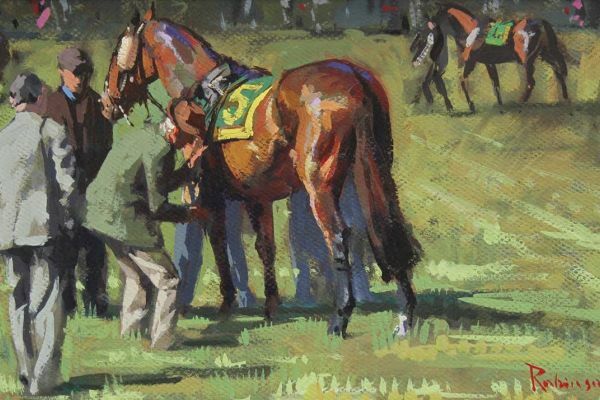 Tickets will be available at the door for $90; $25 of the ticket price is tax deductible as the show will benefit The Maryland Horse Industry Foundation. 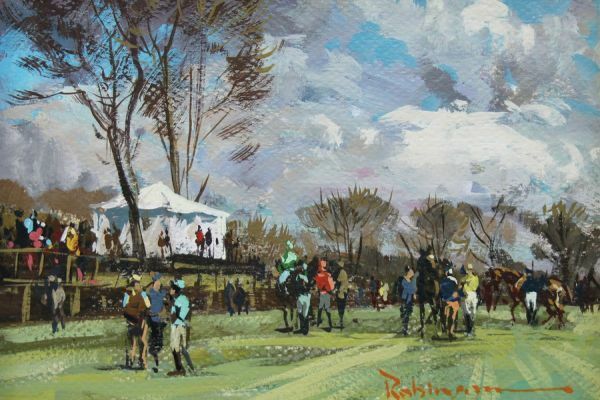 Heavy appetizers, white wine, mixed drinks, and an assortment of non-alcoholic beverages are included in the price of ticket. 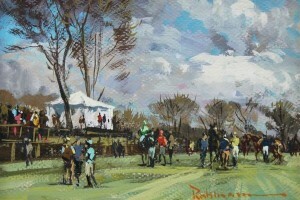 For more information on the show, please visit The Maryland Horse Industry Foundation’s website. 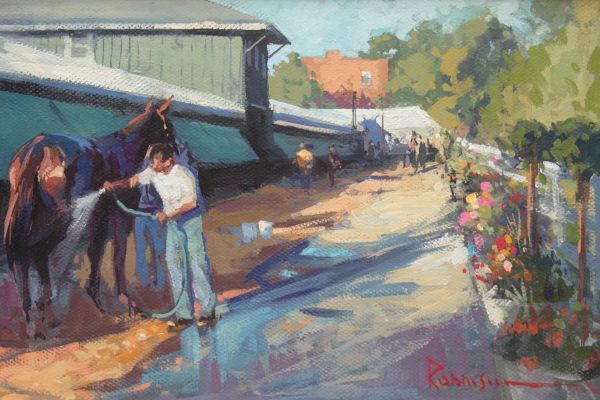 Some of my favorite of Sam’s pieces are below: Good Morning; Sagamore Silks; Summer Wind; Morning Routine; The Girth; Pharoah’s Bath; Chestnut in the Sun; Jockey Tent, Shawan Downs. 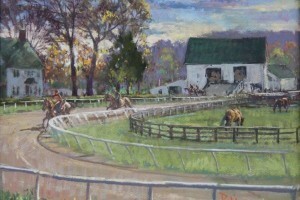 Opening Cocktail Reception: May 16, 2016, 5 – 8 p.m.
After May 16th, the showing will continue through June at the Halcyon House, Tues-Sat, 10 a.m. – 5 p.m.